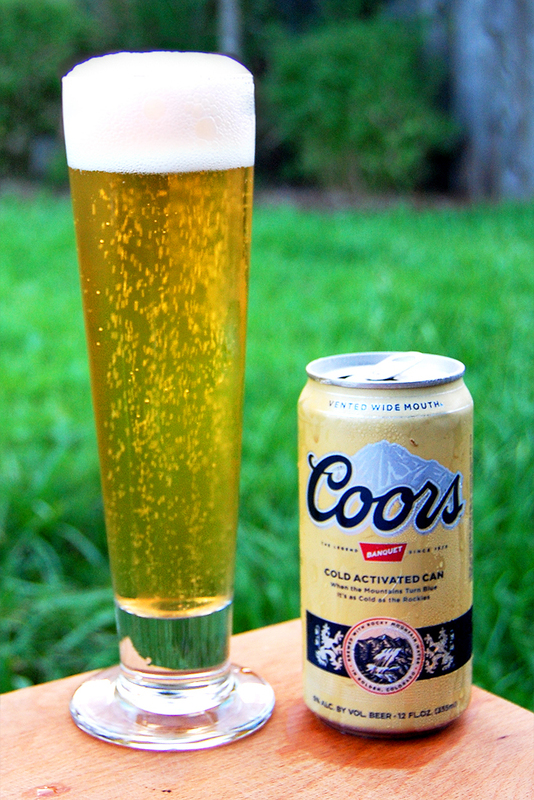 First brewed in 1873, Coors Banquet (or Coors Original), is the oldest brand in the Coors stable. Originally brewed by Adolph Coors in the foothills of the Rocky Mountains, this is the beer that launched the Coors empire. It's also the beer the Bandit was hauling in the American film classic Smokey and the Bandit. So there's that. As with the other big brewers flagships, Coors Banquet has been vastly outpaced market-share wise by it's Light counterpart. However, while Budweiser and MGD are still well-known brands, Coors Banquet has slipped somewhat into obscurity. In the last few years, though, Coors has been shaping Banquet into a nostalgia brand in the likes of High Life and Pabst Blue Ribbon. The only ingredient Coors like to push is the water (never a great sign), and they maintain that the 100% Rocky Mountain aqua used gives Banquet it's unique smooth character. Shall we dive into the Mile High taste? Appearance: A crystal-clear straw-colored body capped by two fingers of fluffy white head that burn out quickly and leaves no lace. Aroma: Sweet and grainy malt along with lemony hops that keep everything balanced nicely. Taste: As the nose promised, the flavor profile is composed of lemony and somewhat grassy hops over a sweet, grainy malt backbone. There’s a bare hint of something buttery in here, but it doesn’t linger long enough for proper identification. It’s about average for the style in intensity (that is to say, weak). A little bit of husky malt in the mostly clean finish. Mouthfeel: Medium-light bodied with sharp carbonation and a crisp finish. Drinkability: Same old same old for the style: imminently drinkable for fans of the flavor profile. Verdict: While Coors Banquet suffers from the same problems as the other beers in the style, it’s balanced better than much of its competition. Balance alone, however, is not enough to win the day. Its really different blog when anyone will see this blog will say wow really nice.